Baby Rhino Lunar at Baby Rhino Rescue | Adopt and Donate Now! Lunar came to Care for Wild in June 2011.She was born in February of that year. Her mother was killed by a bull elephant when she was approximately 4 months old. Lunar has been with Care for Wild Africa the longest. She was not very healthy when she came in. She "died" three times on arrival and Petronel had to resuscitate her. More time and energy has been given to Lunar than any of the other rhinos. The attention was well worth it because Lunar is now a most beautiful young adult. The volunteers love to stand at the fence when she is in for the night, just staring at her incredibly lovely curves. When standing at the boma fence, one cannot help but marvel at how magnificent she is. Her head is sculpted and looks like a work of art. Lunar weighs more than a ton, but she is a most gentle young lady. She still loves attention and comes to the night pen gate if anyone is there. She is very vocal and loves squeaking to get her point of view across. Lunar is extremely clever - she knows how to open the gates by sliding the latch with her horn so she can go and play in the outside bomas. There are now double locks on to stop her!When she returns from the bush to the night boma to sleep, she always checks to see if perhaps the gate to the goat enclosure might be open. If it is, Lunar runs in because she loves goat pellets and makes sure that she gets them whenever she can. No one can coax her out of the goat enclosure if there are pellets to eat. Lunar shares her enclosure with Storm. 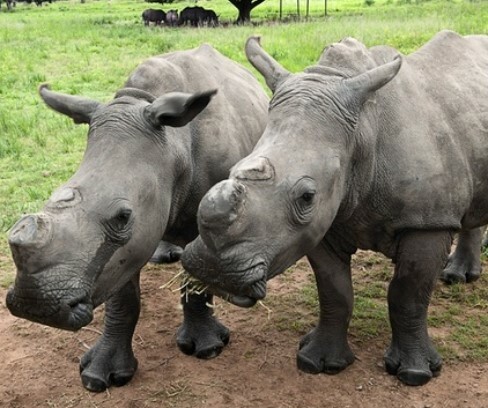 The two rhinos have an incredible bond. They have been together from almost the beginning and are soul-mates. Once, when Lunar was separated from Storm, she broke down a heavy-duty door to get to him. She also loves Petronel, remembering clearly, all the times when she was ill and Petronel was there for her at all times of the day and night. Everyone hopes that Storm and Lunar will mate when they are old enough, bringing a baby rhino to the sanctuary, a baby that will be born free and live in safety beside its mother and father. This is the day that all long for.